Australia will either lead or play a very significant role in the campaign against Islamic State terrorists in the Southern Philippines, says David Petraeus, former coalition commander in Iraq and then in Afghanistan. Interviewed by The Strategist at a Liberal Party gala dinner in Sydney, General Petraeus urged Australians to be reassured by what the United States did rather than by what President Trump said in his tweets. ‘What you have to do is jettison the campaign rhetoric or at the very least contrast it with what has actually taken place. And then if you follow the money and follow the troops, don’t follow the tweets, follow what’s going on the ground, you’ll see the NATO forces are moving into the Baltic states and into eastern Poland.’ The US was providing more support to Europe to deal with a resurgence of an aggressive, adventurous Russia led by President Putin. General Petraeus said Donald Trump was a pragmatic president. ‘He’s somebody who’s showed that he would do what was necessary to get elected and I think he will do what he needs to do to be successful. ‘I think the national security team that has been established is arguably the finest in recent memory; a terrific national security advisor [H. R. McMaster]. He and his deputy both had many tours together on battlefields, battlefields on the Potomac as well. [Defense Secretary] General Mattis, long-time combat comrade, buddy, boss, at one time he replaced me when I went down to Afghanistan; stayed close even after government. But he also said that to deal with Beijing’s island building activities in the South China Sea and the ‘outrageous nine dash line assertion’, freedom of navigation exercises were hugely important as was a strategic dialogue. Ungoverned or even inadequately governed spaces in the Islamic world will be exploited by extremists. It’s not a question of if, it’s a question of when and how big will it be. Unfortunately Las Vegas rules do not apply in these areas: what happens there does not stay there. Rather, they tend to spew violence, instability, extremism and a tsunami of refugees, not just into neighbouring countries, but in the case of Syria, a geopolitical Chernobyl meltdown of a country that has actually spewed them into Europe causing the biggest challenges domestically for our allies there. You have to do something. You can’t … admire a problem until it goes away. These problems aren’t going away. In most cases the US is going to have to lead. We’ve learned how to do this now, where we are enabling others. They’re doing the fighting on the frontlines. That’s hugely significant. You have to have a comprehensive approach. You’re not just going to just drone strike or Delta Force raid your way out of this problem. You’re going to have to have armed forces on the ground. You’re going to have all of the elements of the civil military campaign plan that we had, frankly, in Iraq, but we don’t want to be doing all of them and we’re able now to do that in places like Iraq and in Syria and some others. You have to have a sustainable commitment. That’s not easy but it’s being done now in Iraq. 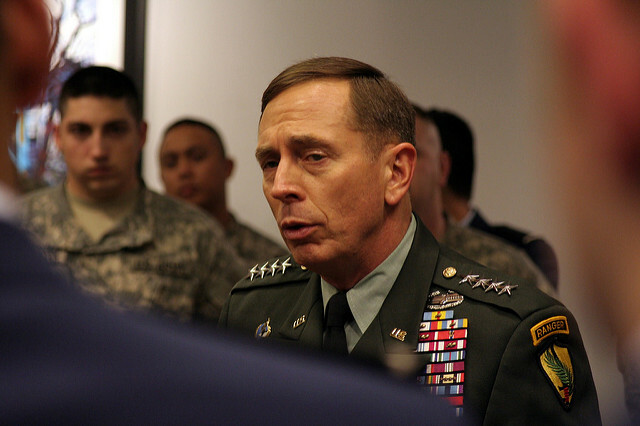 In 2007–08, General Petraeus was able to negotiate with diverse and opposing tribal factions in Iraq to bring the insurgency under control for a time. He said he believed that despite the current bloodshed in Iraq that sort of nation reconciliation was possible again. ‘When I was negotiating that I had a great position. I was the sheikh of the strongest tribe in Iraq. Having 165,000 American soldiers, sailors, airmen, marines, and then tens of thousands of additional coalition forces and others, was hugely helpful. Brendan Nicholson is defence editor of The Strategist. Image courtesy of Flickr user Hector Alejandro.